You have the skills, the equipment and the clients. Writing an estimate for a paint job and figuring out the numbers so you make good money and the client pays a fair price is not that difficult. There is no magic formula, but some commonsense guidelines will help you write a fair quote and get the job. Show up on time for your appointment with the client. While it's not necessary to dress up--you may be dressed for a day's painting--try to be neat, punctual and pleasant. Walk the job with the client and take notes while answering questions and concerns. Figure time and materials. This is the most common and easiest way to figure out your costs and estimate how much you will make. While you are looking over the job, estimate how much paint and materials you will need. Don't forget primer, sandpaper, special tools, painter's tape, solvents and any other materials you will need to do the work well and professionally. If you are not sure whether it will take 7 gallons or 8 gallons, err on the side of caution and estimate it will take more paint rather than less. If you overestimate the materials, you can either take it as a little extra profit on the job, or for brownie points with the client, give him a rebate at the end of the job. Sometimes little touches like this will impress people and you will be more likely to get referrals to other jobs. Calculate how much time it will take you to complete the job, including cleanup and getting everything put back together. There is no formula for what you will charge per day, or per hour on small jobs. The prevailing rates for your geographical area, how much you need to make, how badly you want the job--all these figure into what you decide to charge. Only you can estimate how long it will take, based on experience, to paint a house. Remember that some clients will discard the cheapest bid, thinking that the painter will cut corners in order to make enough money. Most clients are getting more than one estimate and being mid-range in price is most likely to get you the job. A bid that is significantly lower, or significantly higher, than other estimates will likely be discarded. Take into account gas and driving time, and other business costs such as tools, insurance, taxes and vehicle upkeep. These costs all cut into your profit and if you can't pay your bills and maintain your equipment, you can't do a good job. Write a detailed estimate, give one copy to the client and keep the other copy with your notes. Include all the prep you will do, the number of coats of paint, whether you will be using primer, and provide a list of the types of paint you will use. The more detail the better, as it will help a client choose a painter and most people appreciate full disclosure in an estimate. Make it clear who will take responsibility for moving furniture, window treatments and cleaning up. Also include roughly how much time it will take and when you are available to start. Writing a paint estimate for new construction is a little different. Generally, you are dealing with the general contractor or builder, and new construction is most often estimated on a square-foot basis, often from blueprints. You will need to find the prevailing square-foot price for your area by asking the salesperson at your paint supply store or talking to other painting contractors. The price will vary, depending on whether it is a basic tract home or a custom home. Determine the square-foot price and figure out the costs carefully. 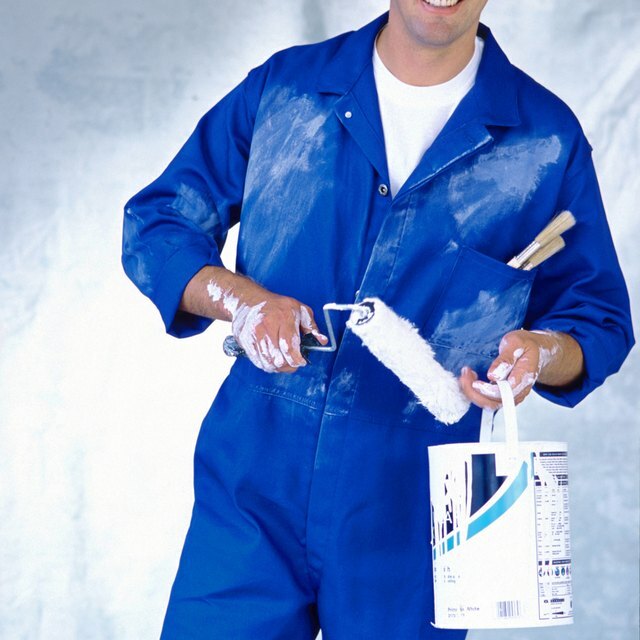 Estimate how much paint and material you will need, your labor costs and cost of insurance and related expenses. Compare the square-foot estimate with the time and materials estimate. They should not be too different from each other. If there is a big disparity, go over your figures carefully and try to determine where the discrepancy is. Open an account at a good paint store and negotiate the best pricing structure you can. Having an account at a good, full-service paint store will keep your costs lower and a charge account can be very useful when cash flow is intermittent.